** Generate barcode images and copy to the windows clipboard. ** Over print a barcode on existing forms, shipping labels, invoices, reports, etc (Pro). ** Print batch various barcodes on one paper, or export to many popular formats graphic files (Pro). ** Run from command line (Pro). ** Easier Barcode Label Maker --- Design and print more complex labels contain barcodes, texts, logo, etc. funds transfer, wire transfer, check, etc. * The unit price is dependent on the order quantity. The full version software has more convenience on input data. ***** Barcode Generator supports large batch of bar code labels' input and print. It requires you to input the contents of the hundreds of thousands of labels at one time, instead of one by one, then, bar code labels are printed with batches. The contents of bar code labels can also be input in Excel in advance, then, it is input in Barcode Generator software, and bar code labels are printed with batches. It makes your job more simple and more efficient. (1) This program can import Excel data, so you can edit the barcode’s data in MS Excel. (2) Print multiple different barcodes in one page from multiple line text. 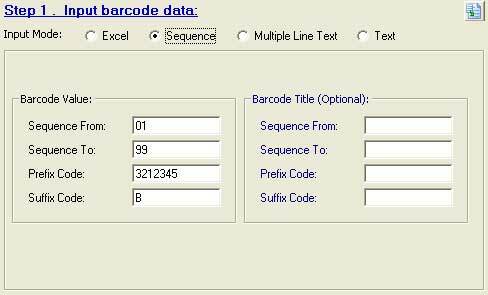 (3) Generate multiple barcode labels of a sequence barcode numbers. If you need to over print a barcode on existing forms, shipping labels, invoices, reports, etc. Barcode Generator & Overprinter can satisfy your requirement, just need a few quick mouse motions to set the print position, you can print barcodes on any existing forms. You also can print batch various barcodes on one paper, or export to many popular formats graphic files, or copied to the windows clipboard, they can be paste to the shipping label, invoice, etc. or import into desktop publishing software, word processing software or the reports program of the ERP, MIS system, or insert barcodes to MS Word, Excel file and Avery label templates. Barcode Generator supports all the most popular bar code types, the barcode’s data can be import from text or Excel file. Barcode Generator gives you the flexibility to meet your most demanding labeling needs, it is a good choice for those who want an easy way to print bar codes. >> Barcode Since their invention more than 50 years ago, barcode have been enablers for accurate data capture, the rapid movement of goods, and all types of automation. Whether at the Point-of-Sale, in a hospital, or in a manufacturing environment these little black and white images deliver incredible value. >> There are many different bar code symbologies, or languages. Each symbology has its own rules for encoding characters (e.g., letter, number, punctuation), printing, decoding requirements, and error checking. >> Barcode symbologies differ both in the way they represent data and in the type of data they can encode: some encode numbers; others encode numbers, letters, and a few punctuation characters; still others offer encodation of the 128 or 256 ASCII character sets. Recently unveiled symbologies include options to encode characters in any language as well as specialized data types. >> Barcode in common use are covered by international standards. International standards also cover print quality measurements and equipment.